Guests can take illustrations away with them, or they can be digitally scanned and delivered after the event for a small extra fee. Suitable for : Conferences, workshops, blogging events, fashion events, press days, events with a female focus, vintage fairs, charity events, wedding and hen parties. Past clients include: Tesco & The Blogcademy. *The paper I use at events is 100% recycled and refillable pens are used where possible. Photo from The Blogcademy London 2014. Private group workshops (up to 20 people) can be organised on request. I speak on art & illustration professional practice and ethical art practice. I teach and demo pin up art and fashion illustration techniques, watercolour and drawing techniques and life drawing with a vintage, pin up or burlesque twist. I also demonstrate how to create digital crafting projects and how to make your own digikits using Serif CraftArtist. All tuition, workshops and speaking is tailor made for you to suit your personal interests or your event. Life models and pin up models can be arranged on request. Suitable for: University and college guest lecturing, private art tuition, workshops, business and women’s events, vintage events, hen parties. Past clients include: Nottingham Trent University, Central College, BBC, Serif Software for Create & Craft TV. 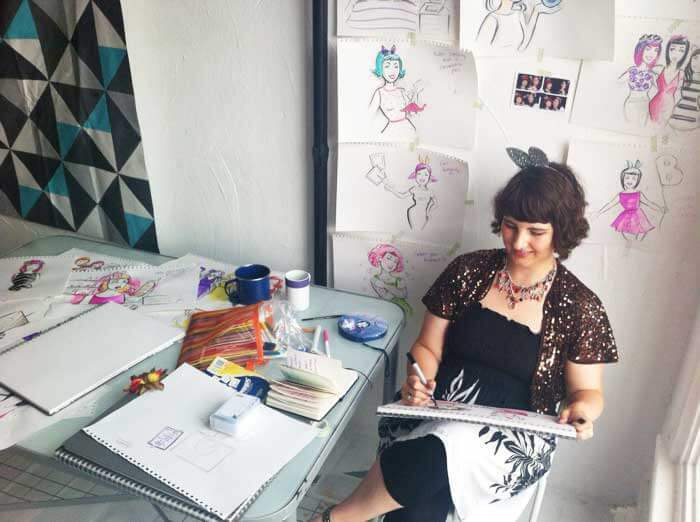 I am also co-founder of Dr Sketchy’s Anti Art School Nottingham est. 2009. *Photo from Dr Sketchy Nottingham by Martyn Boston featuring Beau Rock’s bottom. £35 per hour standard rate. Prices from £300 for an A3 sized commission. Original artwork makes a wonderful, personal gift or can give your business a truly unique look. Commissioned artwork is created to your specifications, you are involved at every step of the creation, from sketch to completion, to ensure the finished artwork is just what you envisioned. It can takes 40 hours or longer to complete an A3 commissioned pin up portrait. I require 3 good quality photographs to work from and request that you allow 3 months from your initial enquiry to the date the painting is required. Past clients include : Love My Dress, Wonderbra, What Katie Did, Eternal Spirits Corsetry, countless beautiful brides, couples and burlesque divas! 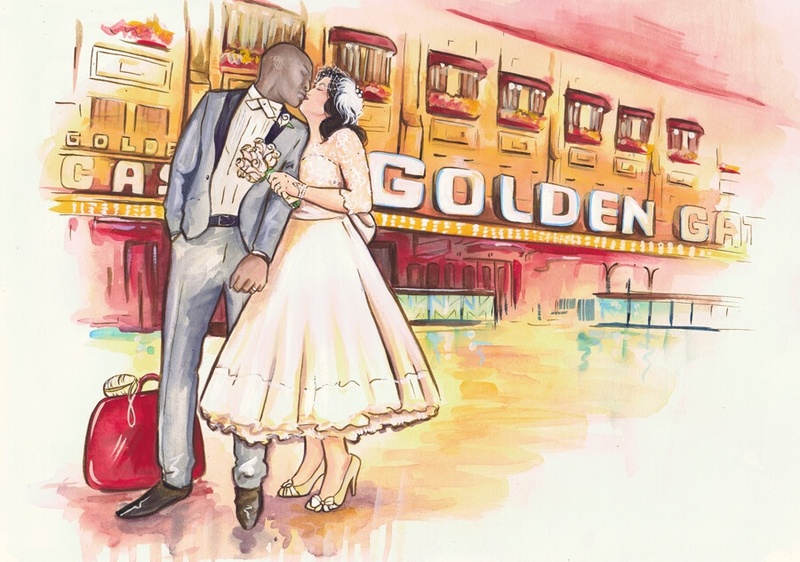 *Portrait of Kim & Alvin’s Las Vegas wedding – watercolour.